Washington -- Dozens of organizations and decision-makers that oppose breaching of the Lower Snake River Dams in Washington State said Dec. 6 that they are urging that the incoming Trump Administration to directly intervene and/or convene a "God Squad" committee to protect the Lower Snake River Dams and put an end to discussions about breaching them. The request to the Trump Administration comes on the heels of a recent ruling by federal Judge Michael Simon in Portland, Oregon, in which he ordered that a new environmental study be done regarding the Lower Snake River Dams, after the federal government's latest plan for protecting threatened and endangered salmon indicated that breaching Snake River dams did not need to be considered and would cost at least $3 billion to taxpayers. Additionally, with President-elect Donald Trump stating that he will invest $1 trillion to improve the nation's infrastructure (including transportation, clean water, and a modern and reliable electricity grid), the opponents of breaching hope that Trump will stop this expensive attempt to try to remove vital energy and transportation infrastructure (the Lower Snake River Dams). New wind and solar generators depend on the dams for back-up power to make them economically viable. Furthermore, according to an October 2015 news release from the U.S. Army Corps of Engineers, the Commander of the Walla Walla District of the U.S.
Army Corps of Engineers stated that the Lower Snake River Dams provide a marine transportation corridor that helps move 3.5 million tons of cargo, worth $1.5 billion a year, to regional markets. On a related note, the Washington Association of Wheat Growers says the Columbia and Snake rivers make up the third-largest grain export system in the world. To move the same amount of wheat by road or rail annually would require 137,000 trucks or 23,900 rail cars. Moreover, the Lower Snake River Dams provide irrigation for 60,000 acres of high value irrigated crops. "If the dams were breached, the pump stations would not function," stated Dr. Darryll Olsen, Board Representative for the Columbia-Snake River Irrigators Association (CSRIA). "The end result would be a substantial reduction in irrigated acres, which would have a huge negative impact food processing and agriculture in the Pacific Northwest." The opponents said the Endangered Species Act allows the Trump Administration's new Secretary of Interior to convene an Endangered Species Act Committee, or "God Squad," to set reasonable boundaries for hydro system operations. They said the Bonneville Power Administration has spent $15 billion to successfully mitigate the dams' effect on fish and wildlife. 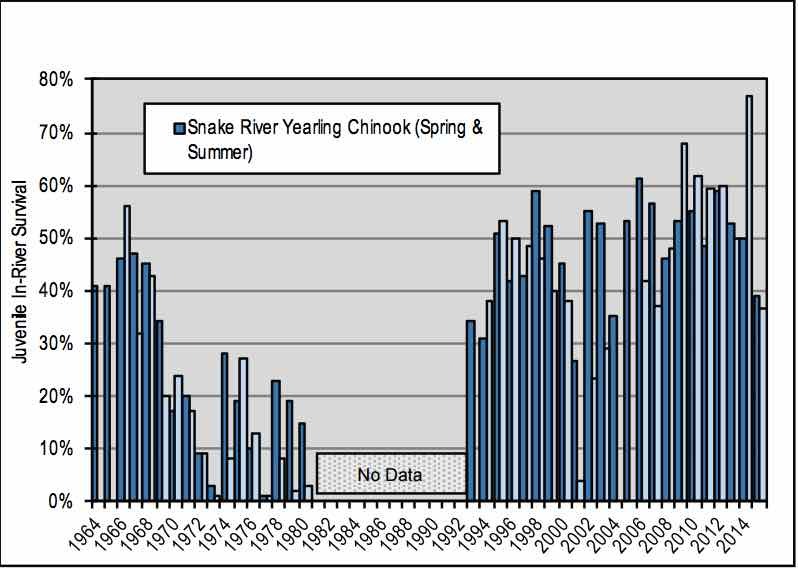 In 1992-93, there were about 800 fall chinook above the Lower Granite Dam on the Snake River, according to CSRIA. The 2014-15 count of adult fish found about 35,000 wild Snake River fall chinook. According to fish survival data, the survival rate at each dam on the river is about 92% to 95%.